At GTC 2012 (GPU Technology Conference), NVIDIA CEO Jen-Hsun Huang in his keynote speech introduced VGX technology to power cloud computing VDI (virtual desktop infrastructure). NVIDIA VGX is based on NVIDIA's new Kepler GPU architecture that also powers the latest NVIDIA gaming GPUs like the Geforce GTX 680. VGX technology is primarily meant for enterprises who want to deliver remote desktop connections to GPU powered servers that reside in cloud computing data centers. VGX enables IT departments to deliver a virtualized desktop with the graphics and GPU computing performance of a PC or workstation to employees using any connected device. 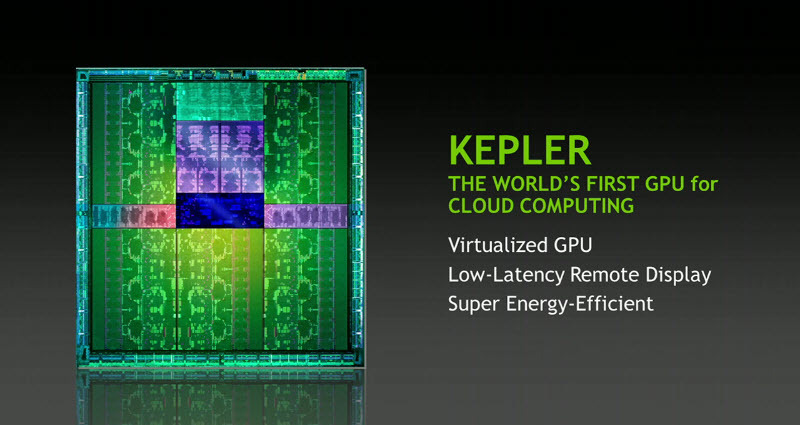 But NVIDIA also intends to use the VGX tech for their Geforce GRID cloud gaming technology. In a demo, NVIDIA showed off an iPad running Citrix Receiver connected to the VGX virtual GPU and displayed a 3D simulation running in Autodesk Maya on Windows that ran in real time. 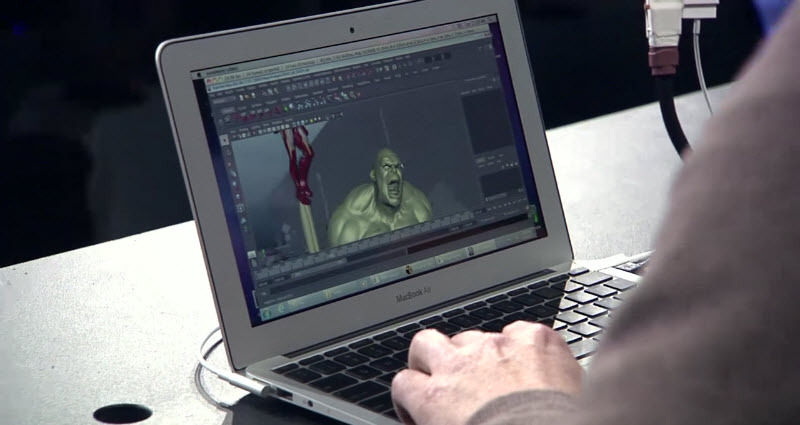 A second demo showed Grady Cofer (visual effects supervisor at Industrial Light & Magic) using a Macbook Air to remotely access the ILM render farm to make changes to scenes from The Avengers and Battleship in real-time. Not only has NVIDIA revealed their Geforce GRID cloud gaming technology that provides OnLive's competitors in the cloud gaming arena with competitive tech, with NVIDIA VGX they also intend to provide Citrix and fellows with something that can take on OnLive Desktop. Especially for Citrix, OnLive Desktop is a thorn in the foot as they strugle to come up with a VDI product that can compete on a technical level with OnLive Desktop. Of course this doesn't mean that OnLive won't license and purchase the tech from NVIDIA when it fits their needs and I'm sure NVIDIA will be quite happy to sell it to them. 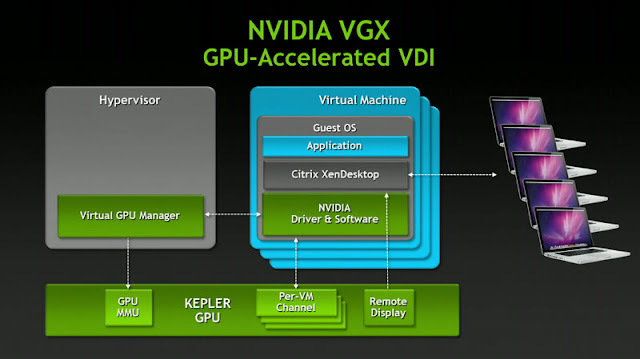 Apart from Citrix, NVIDIA is also working with VMware and Microsoft to deploy their VGX platform. NVIDIA VGX enables knowledge workers for the first time to access a GPU-accelerated desktop similar to a traditional local PC. The platform's manageability options and ultra-low latency remote display capabilities extend this convenience to those using 3D design and simulation tools, which had previously been too intensive for a virtualized desktop. Integrating the VGX platform into the corporate network also enables enterprise IT departments to address the complex challenges of BYOD -- employees bringing their own computing device to work. It delivers a remote desktop to these devices, providing users the same access they have on their desktop terminal. At the same time, it helps reduce overall IT spend, improve data security and minimize data center complexity. "NVIDIA VGX represents a new era in desktop virtualization," said Jeff Brown, general manager of the Professional Solutions Group at NVIDIA. "It delivers an experience nearly indistinguishable from a full desktop while substantially lowering the cost of a virtualized PC." NVIDIA User Selectable Machines (USMs). This manageability option allows enterprises to configure the graphics capabilities delivered to individual users in the network, based on their demands. Capabilities range from true PC experiences available with the NVIDIA standard USM to enhanced professional 3D design and engineering experiences with NVIDIA Quadro or NVIDIA NVS GPUs. With the NVIDIA VGX platform, IT departments can serve every user in the organization -- from knowledge workers to designers ---with true PC-like interactive desktops and applications. 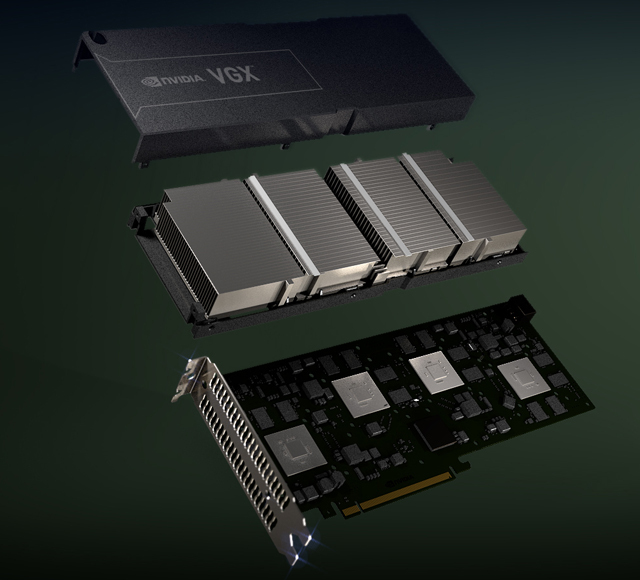 NVIDIA VGX boards are the world's first GPU boards designed for data centers. The initial NVIDIA VGX board features four GPUs, each with 192 NVIDIA CUDA architecture cores and 4 GB of frame buffer. Designed to be passively cooled, the board fits within existing server-based platforms. Traditional VDI experience has been challenged by the long latencies associated with both the network and rendering, capturing, and encoding in the server. The new NVIDIA Kepler architecture addresses these delays with integrated, low-latency remote display capabilities. This performance greatly benefits professional clouds for workstation and business desktops by improving the user experience to a level where corporate-wide LAN and WAN deployments are finally possible. The Kepler GPU architecture also includes a high-performance H.264 encoder engine that's capable of encoding simultaneous streams with superior quality. This provides a giant leap forward in cloud server efficiency by offloading the CPU from encoding functions and allowing the encode function to scale with the number of GPUs in a server. Plus, the on-chip encoder can be fed in a single pass via low-latency capture. Optimizing performance per watt demanded an entirely new approach to power management. Every hardware unit in Kepler is designed from the ground up to provide outstanding results, including the revolutionary new streaming multiprocessor, called "SMX". The result is an innovative, proven solution that delivers revolutionary performance per watt for the enterprise data center. 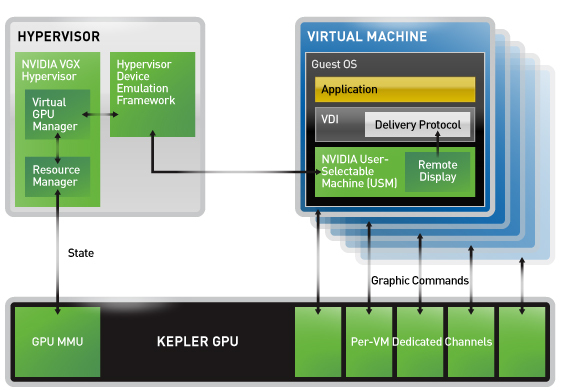 The NVIDIA VGX GPU Hypervisor - based on NVIDIA's new Kepler GPU architecture - and the NVIDIA driver enable the virtual machine to talk directly to a GPU. Creating, for the first time, a true PC experience in the cloud. USMs allow better utilization of hardware resources, with the flexibility to configure and deploy new users' desktops based on changing enterprise needs. This is particularly valuable for companies providing infrastructure as a service, as they can repurpose GPU-accelerated servers to meet changing demand throughout the day, week or season. "Desktop virtualization is rapidly becoming mainstream for enterprises. 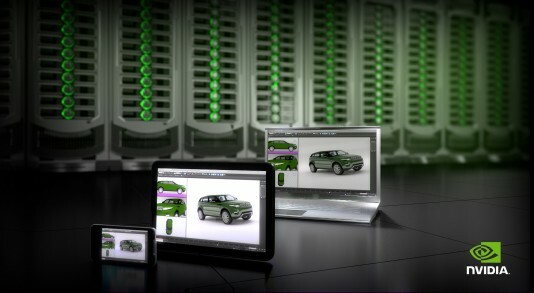 By leveraging the NVIDIA VGX platform, combined with XenDesktop and HDX technologies, we are enabling enterprise customers to virtually deliver graphics-intensive apps beyond power users and designers. Now, they can also serve users who require only occasional access to graphics-intensive apps, which previously would have been cost-prohibitive. The combined virtual desktop solution for serving these users can be reduced by up to 80 percent, while enabling users to securely access GPU-accelerated apps from any device," said Sumit Dhawan, vice president and general manager of Receivers and Gateways at Citrix. "NVIDIA virtualized GPU technology aligns with Cisco's vision of cloud and delivery of desktop and rich-media applications. GPU virtualization is the one major technology challenge that has been holding back deeper adoption of VDI in the enterprise. We believe NVIDIA's breakthrough will deliver the unique user experience and ease of management customers have been demanding," said David Yen, senior vice president and general manager of Data Center Business Group at Cisco. "Virtual desktop environments can enable mobile workforces to perform tasks more efficiently. With HP VirtualSystem utilizing HP Blade Servers and the NVIDIA VGX platform, clients can easily deploy a simplified virtualized environment that quickly delivers the information or applications users need," said Chuck Smith, vice president of Worldwide Industry Standard Servers at HP. The NVIDIA VGX platform, including new NVIDIA VGX boards, the NVIDIA VGX GPU Hypervisor and NVIDIA USMs, is planned to be available for deployment across the enterprise through NVIDIA's hardware OEM and VDI partners later this year. Additional information is available at www.nvidia.com/object/vdi-desktop-virtualization.html. I sure hope that doesn't require too much changes to any machine. Anything like specific data cabling could easily kill this innovation.